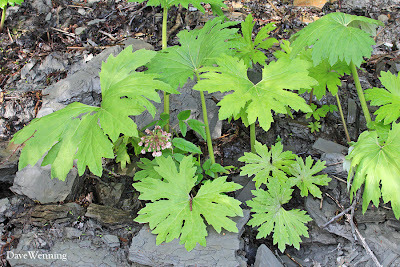 Palmate Coltsfoot (Petasites palmatus) has been one of my mystery plants. I had seen it growing from the shear cliff face on the north shore of Similk Bay. The first time I went to get a photo, I found that some of the cliff had collapsed. Only one small, uncharacteristic plant remained. Last month, I trekked into Similk Bay again and found a large patch. With better photos, the identification is now obvious to me. Credit for ID'ing the plant goes to Mike B. at Slugyard.com, who accomplished it even with a very poor sample photo. It is an impressive native plant with some leaves more than a foot across. The Quinault Indians of Washington State used the leaves to cover berries and steam them in cooking pits.